The Youth Opportunity Center (YOC) is a residential treatment facility located on the Northwest side of Muncie, Indiana. Formally known as the Delaware County Children’s Home, the facility focuses on addressing the needs of children and adolescents who are identified as having difficulties at home, school, or in the community. This might include, but is not limited to, youth exposed to physical, sexual or emotional abuse and neglect, or youth exhibiting suicidal ideation, school truancy, homicidal behaviors, behavioral disruptions, emotional distress, physical aggression and chemical/drug abuse. What makes the YOC unique? The staff of psychiatrists, psychologists, physicians, therapists, administrators, therapists and program managers work collectively to effectively deliver diverse treatment interventions to meet psychological needs of each child. 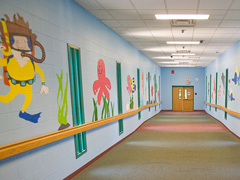 YOC utilizes a multi-team approach using evidenced based strategies such as: Cognitive behavioral therapy (CBT), trauma focused cognitive behavioral therapy (TF-CBT), and dialetical behavioral therapy (DBT) which are standard forms of treatment modalities utilized to strengthen the child and the family. Individual, family and group therapy are part of the weekly milieu within the program schedule. Additionally, youth engage in skill building sessions, independent living services, character education, mentoring programs, culturual activities, spiritual services (optional),community engagement and wellness programs. Muncie Community Schools (MCS) provides an accredited educational programs for elementary, middle and high school students on the campus of the YOC. The structured educational setting provides student with an opportunity to learn at their individual level in the small sized classrooms. Students may also attend county or city schools within Delaware County, as deemed appropriate by the treatment team and the parents/guardians. Family involvement is important to the YOC and we work to involve the families in every aspect of a child’s treatment. Families will particpate in family counseling, parenting classes, family activities, treatment planning, medication reviews, and educational planning. Parents will have active communication between the treatment team working with their child.